Thank you for your interest in one of Classic Motor Cars's online offerings. 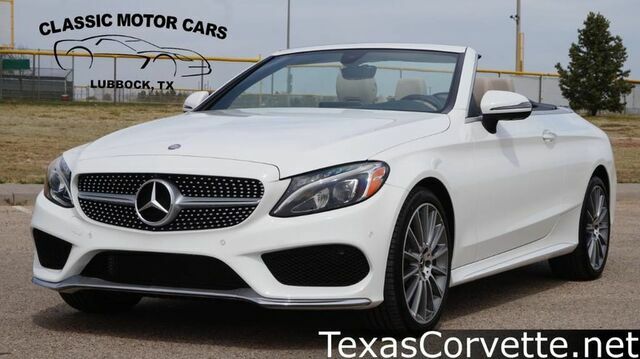 Please continue for more information regarding this 2017 Mercedes-Benz C-Class C300 with 1,595mi. HEATED AND COOLED, PERFORATED LEATHER APPOINTED FRONT BUCKET SEATS. How to protect your purchase? CARFAX BuyBack Guarantee got you covered. Every day feels like Saturday when you're driving a well-maintained, plush convertible like this one. There's a level of quality and refinement in this Mercedes-Benz C-Class that you won't find in your average vehicle. No matter the weather conditions or terrain, this Polar White AWD Mercedes-Benz C-Class handles with an elegant confidence. Fine interior appointments complement this vehicle's unprecedented performance. Where do you need to go today? Just punch it into the Mercedes-Benz C-Class on-board navigation system and hit the road.